No one denies that some priests have terribly abused minors, and some bishops failed to act properly to stop this unspeakable harm. This is the qualifier that must be placed before any rational discussion of the sexual abuse scandals. However, there is a story that is not being told. In the hysteria surrounding these scandals, many innocent priests are being falsely accused. No one tells their story. 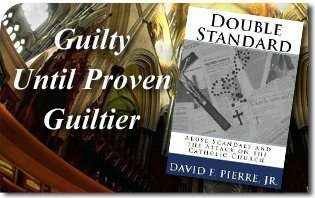 David F. Pierre’s book Double Standard: Abuse Scandals and the Attack on the Catholic Church is a book that does much to expose this grave injustice. The author cites case after case of media mistreatment of the scandals. One finds total publicity for those making accusations and little exposure for the priests to proclaim their innocence. The slightest charge receives a media uproar whereas the rampant abuse in the public schools and administrative cover-up get almost no coverage. Decades-old cases involving deceased priests are treated as if they happened yesterday and are constantly rehashed by the media. One often sees all the efforts the Church has made to remedy the situation ignored by activists and reporters. However, the worst part of this attack is that the priests themselves are marked forever as an accused. When priests are exonerated, their innocence is rarely reported and some are taken out of their ministries “just in case.” Some of these are priests with excellent records of decades of parish work without incident. The priest who has every right to his good reputation is not given this right. A number of priests have even refused to plea bargain and admit to a guilt they do not have. One of these chose to go to prison until he can establish his complete innocence. 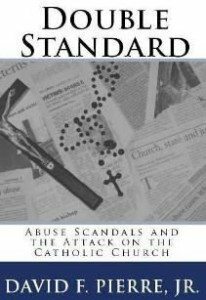 To purchase Double Standard: Abuse Scandals and the Attack on the Catholic Church by David F. Pierre, Jr., please click our Amazon.com link. A percentage of what you pay will benefit the TFP. This entry was posted in TFP Recommends Books and tagged abuse, Abuse Scandals, attack, bishops, book, Books, Catholic, Catholic Church, Church, David Pierre, Diocese, Double Standard, exonerate, Guilty Until Proven Guiltier, Injustice, innocent, minors, parish, priest, public, recommend, scandal, School, sexual, TFP, work by John Horvat II. Bookmark the permalink.